You're reading it right, it is not TELEPHONIC but it's TELEPHONIAC. It is yet another word that comes into my mind after my last post about being HALF MINDED. As usual, I would be giving my personal meaning to this out this world word again. Well, by merely looking at the picture on the left, you might probably know already what does it mean. As what I have learned from my reviewer on my licensure review 3 years ago, if you happen to encounter a difficult English word (difficult in the sense that you don't know the meaning and not because you don't know how to read it) try to look for its root word. From then on, you will have a hint on its definition. As to the case of the word TELEPHONIAC, it is pretty obvious that the root word is TELEPHONE and suffix NIAC from the word MANIAC. I know exactly what comes into your mind upon reading the last italicized word I've written. Well, according to WordWeb, MANIAC is a noun pertaining to a person who has an obsession with or excessive enthusiasm for something. Relating it to the word TELEPHONE, then TELEPHONIAC would mean a noun pertaining to a person who has an obsession with TELEPHONE. 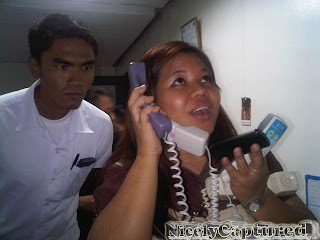 A busy secretary answering several phone calls inside a very busy office can be described as TELEPHONIAC or if a person happens to collect different designs of telephones and even makes a separate room for it in his/her house can also called TELEPHONIAC. Makers of Webster and Oxford dictionaries might as well include these words in their list from now on so that I can use it whenever I play scrabble or Word Factory.